Beautifully renovated 4 bedroom, 3 bath home with *private heated pool. Located 4th row from the ocean this adorable house has everything. Completely updated with tile floors throughout, granite counters, and new stainless steel appliances. An open and inviting main area of the home encompasses the kitchen, dining area, and living room. This area leads to the lovely screened porch and swimming pool. The pool area has plenty of chaise lounges along with a table and chairs, perfect for dining al fresco. There are 2 master suites, each with king bedding and a private bathroom. The 3rd and 4th bedrooms each have a set of twin bunk beds and a twin bed. These rooms share a hall bath. Every bedroom has a flat panel TV for your viewing pleasure. 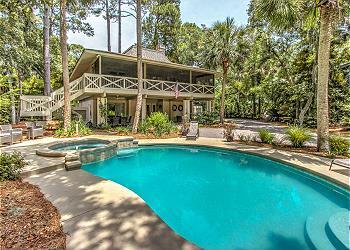 Just a short walk to the beach, this Sea Pines home has everything your family needs for a memorable vacation.